For many of us, it’s not Christmastime until the tree is in the house with decorations and ornaments. If you fall into that category, you’re probably itching to go out and select the perfect live tree for your space, if you haven’t already worked it into you post-Thanksgiving duties. • Now is a good time to buy your cut Christmas tree. Balsam, Fraser Fir, Noble Fir, and Douglas Fir trees are the best choices because they absorb water more freely, making them the safest indoor cut tree. • Before you purchase a cut tree, try to break off a small branch with your fingers. If it snaps off, consider it dead. If it does not snap off, cut off a small piece and see if it is green or white, which means the tree is still alive and a good Christmas tree. • Remember to check the water in the stand of your cut tree daily. Allowing it to dry out just one time will cause the trunk to “heal over” which means that it will stop drinking. • Consider spraying your cut or balled tree, fresh evergreen wreaths and greens with Wilt-Pruf. This will help it to retain moisture in the needles throughout the holidays and prevent premature needle drop. It can also be used outdoors to keep not just cut greens fresh, but will protect evergreen plants as well because winter winds tend to dehydrate evergreen leaves on hollies, camellias, azaleas, rhododendron, mahonia and other broadleaf evergreens. One application of Wilt-Pruf will protect these plants all winter long. • Fireproof your tree by using the following homemade recipe: In a four-gallon bucket add two gallons of hot water, one pint Karo white corn syrup, four ounces of liquid chlorine bleach, two teaspoon of 20 mule team borax, two ounces of vinegar and two ounces of Wilt-Pruf. Cut 1-2 inches off the bottom of the tree and place the tree stump into the mixture, leaving it in the mixture for five days. Don’t let the solution freeze. The tree will remain flame-retardant and will stay that way as long as you keep the tree in the same mixture. • If you plan on buying a live ball-and-burlap Christmas tree, remember these easy steps: First, bring the tree into a garage or shed for a few days to help it acclimate from being out in the cold to the indoor environment. Once in the home, keep away from all heat registers, and fireplaces. Put in a container and put ice on top of the root ball. This will allow the tree to remain moist without rotting the roots. Do not allow the root ball to completely dry out. When you are ready to remove the tree from indoors simply reverse the procedure. • As a reminder, store all your chemicals, tools and unused seed for the winter. Remember to make sure chemicals are protected from freezing. All garden hand tools should be cleaned and sanitized with alcohol, and all unused seeds should be stored in air-tight containers in a refrigerator. • Never display a fresh green wreath in between the storm and front doors. The intensity of the sun will bake the wreath and turn it brown. 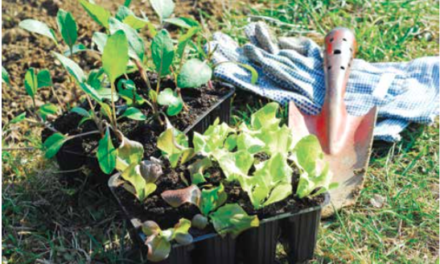 • There is still time to transplant plants and divide perennials. The unseasonable temperatures have allowed the ground temperatures to remain high and we have had an abundance of moisture. This combination will insure that your labor will be successful!